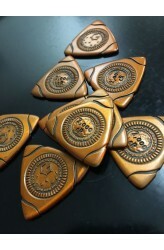 Tavarua is a 1-6 player competitive surfing board game. In Tavarua you are a surfer in a surf contest. You'll need to pick a board, paddle out, look for waves, and ride them in to score points! Tavarua is played over a number of short rounds. In each round waves advance towards shore, players simultaneously select then resolve actions by playing cards, and a wave card is revealed and resolved. Rounds continue until there are no more wave cards in the wave deck, at which point the game ends and one player claims victory. Goal The goal of the game is to win the grand champion trophy, by having the highest scoring waves. You score points by catching and riding waves, but you may only keep your top two wave scores for each board type. General gameplay involves looking for a wave t..
Set of ten 2.000 credits coins for Xia - Legends of a Drift System. .. This is the first expansion for the game Xia: Legends of a Drift System. In its meandering across the galaxy, the drift system of Xia has come into orbit with a dying star. Once habitable worlds now sit desolate waiting to be ransacked by opportunists, and an unknown cold fills the void. New dangers, hidden treasure, and adventure await in this abandoned system. 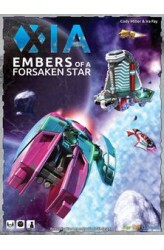 Uncover the mystery in: Embers of a Forsaken Star This expansion adds: New Sector tiles New Mission cards New Ships A solo campaign And much more! 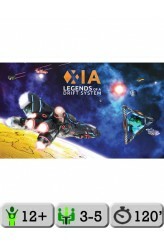 ..
Xia: Legends of a Drift System is a 3-5 player sandbox style competitive space adventure. Each player starts as a lowly but hopeful captain of a small starship. Players fly their ships about the system, completing a variety of missions, exploring new sectors and battling other ships. Navigating hazardous environments, players choose to mine, salvage, or trade valuable cargo. Captains vie with each other for Titles, riches, and most importantly Fame. The most adaptive, risk taking, and creative players will excel. One captain will rise above the others, surpassing mortality by becoming Legend! Customize: Each player begins the game by choosing and customizing a Tier 1 starship. Invest all your money in engines and be a rapid, yet fragile, explorer. Put all your credits into a.. 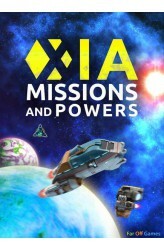 Contains Sellsword miniature and matching card ..
Xia: Missions and Powers is a mini-expansion for Xia: Legends of a Drift System. It includes 54 cards: 21 new ship powers, one for each existing player ship, offering players a choice each time they acquire a ship. The new powers are balanced with the existing powers, but offer greater reliability and can be used multiple times per turn. 32 new missions, with 8 missions of 4 new types: Transport, Assist, Counterfeit, and BOOM! 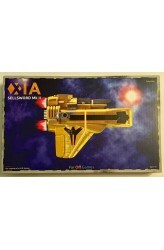 These missions can be started more easily than most other existing missions, since they require only a sector type (e.g. Ice Asteroid) instead of a specific sector. Furthermore, these missions end at players, making them more interactive and easier to complete in the early game, when missions are often difficult. There is also one rules/credi..